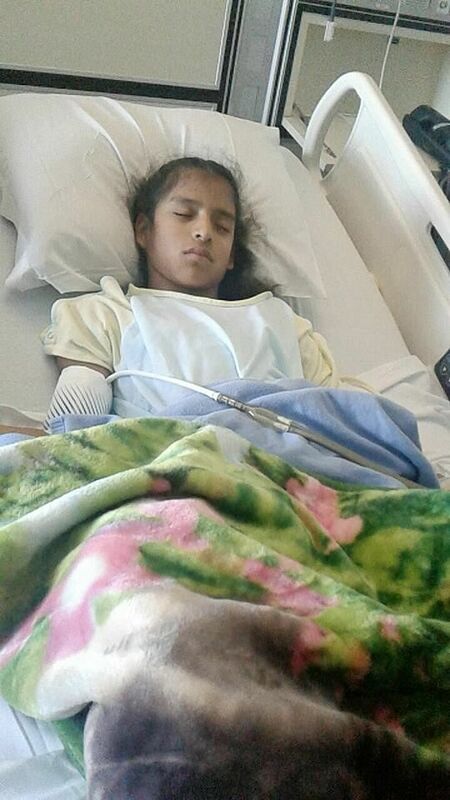 CHICAGO (NYTIMES, REUTERS) - The US government released from custody a 10-year-old Mexican girl with cerebral palsy on Friday (Nov 3), the American Civil Liberties Union said, 10 days after the ambulance taking her to surgery in Texas was stopped at a US Border Patrol checkpoint. Rosa Maria Hernandez has lived in the United States illegally since her family brought over the border to Texas when she was 3 months old. Her detention was criticised by civil rights groups and some Democratic politicians who oppose the crackdown by Republican President Donald Trump on illegal immigration. The circumstances of Hernandez's release into her family's care were not immediately clear. It came three days after the American Civil Liberties Union (ACLU) sued the US government, saying the government arrested the child without a necessary warrant and was violating her rights, in part by denying her doctor's orders for follow-up appointments in the days after the surgery. The US Department of Health and Human Services, which took over custody of Hernandez after she was detained by immigration officials, said in a statement it could not comment on individual cases, but that it treats each child "with the utmost care." Hernandez was taken into immigration custody last week, after an ambulance carrying her and her cousin, a US citizen, from Laredo, on the border with Mexico where the girl lives with her family, to a hospital in Corpus Christi, about 210 km away. Her ambulance had to pass through one of the dozens of US Customs and Border Patrol checkpoints set up on highways close to the Mexico border. When Border Patrol agents discovered that she did not have legal status, they allowed Hernandez to proceed to the hospital and waited outside her room while she began her recovery before taking her into custody and driving her to a federal shelter in San Antonio, Texas, according to Leticia Gonzalez, a lawyer for the girl's family, who filmed the encounter. The US Department of Homeland Security and the Department of Health declined to say if Hernandez or her family would have to meet with immigration officials again or have their case brought to court. Michael Tan, an ACLU lawyer, said in a statement that Hernandez would "go home to heal" with her family. "We're just thrilled - it's such a relief," said one of her lawyers, Michael Tan, a staff attorney at the American Civil Liberties Union. "It's actually quite overwhelming. This was the first time in her life she was separated from her family." Of the next step in her case, he added, "There's really no reason to be targeting Rosa Maria for deportation," given her age and condition. Her parents brought her across the border illegally from Nuevo Laredo, Mexico, in 2007, when she was 3 months old, seeking better access to medical treatment for her cerebral palsy. Those hopes were realized: A government programme for children with special needs has been covering her therapies, a fact that supporters of tougher immigration enforcement have seized on as evidence for the argument that unauthorised immigrants are a drain on resources. The federal Health Department, which oversaw Rosa Maria's placement in the juvenile facility, said Friday that it could not comment on her case because of privacy rules. Customs and Border Protection, the agency that includes the Border Patrol, has said that the agents were legally obligated to detain her in part because she was not traveling with a parent or legal guardian. Though some immigrant advocates questioned whether the agency had violated its policy against arresting immigrants at hospitals, a spokesman said that the agents had taken her into custody at the checkpoint, before she arrived at the hospital.